Ten of the 12 teams in The Star-Herald coverage area have reached the basketball postseason, with three guaranteed spots in the North regional tournament at the Cross Insurance Center in Bangor and the other seven needing to get through the preliminary round to earn a bid. By virtue of their No. 1 seedings, both the Central Aroostook girls (15-3 final record) and boys (15-3) are automatically in the tourney. They will compete in the Class C quarterfinal round on Tuesday, Feb. 19, with the girls playing at 3:35 p.m. and the boys at 8:35 p.m. The Easton boys also are in and will play Schenck of East Millinocket in the Class D North quarters at 2:05 p.m. Monday, Feb. 18. The Bears and Wolverines are both sporting 11-7 records. Easton is ranked fifth and Schenck fourth in the Heal Point standings. The other teams are all fighting to get in. The Ashland girls (7-11) play a prelim game Monday against Jonesport-Beals in Ashland, while the Presque Isle (10-8), Fort Fairfield (14-4) and Washburn girls (8-10) all play in Tuesday prelims. The Wildcats host Orono, the Tigers host Penquis of Milo and the Beavers host Wisdom. The boys will be in action Wednesday, with Presque Isle (8-10), Fort Fairfield (12-6) and Washburn (6-12) competing for tourney berths. The Class B Wildcats play Foxcroft Academy in Presque Isle at 5:30 p.m., while the Tigers and Beavers are both on the road. Fort Fairfield plays at Sumner in a C prelim, while Washburn is at Van Buren in Class D.
The Easton girls (0-18) and the Ashland boys (3-15) did not qualify for this year’s Class D North playoffs. Coach Ben Lothrop’s Hornets broke a lengthy tournament drought last season and they have a chance to get back as the No. 7 seed. Ashland hosts No. 10 Jonesport-Beals Monday at 4 p.m. in the prelim round, and a victory would propel the team into the Class D quarterfinals to play No. 2 Deer Isle-Stonington, its quarterfinal opponent last year, at 11:05 a.m. Monday, Feb. 18. The Hornets went 7-11 during the regular season, with eight of their 11 losses coming against competitive Class C teams. Jonesport-Beals comes in with a 7-10 record. “We’re still a young team, with only one senior, so we’re happy to have the opportunity to advance,” Lothrop said. Olivia Tardie, that lone Ashland senior, averages 9.5 ppg and is a strong rebounder. Jamie Poulin, a sophomore, also averages 9.5 ppg and is the best foul shooter at 62 percent. Danni Carter, Shelby Stolze and Hailee Cunningham are the other starters and Willow Hall comes off the bench and has played her best basketball the last half of the season. The Wildcats’ season began with adversity when seniors Savannah Rodriguez and Sydney Thompson, both expected to start, were lost due to ACL injuries during the preseason. “After losing them, we weren’t sure what to expect, but the girls worked hard and came up with some big wins,” said head coach Jeff Hudson. The signature victory happened Jan. 25 at home when PI trailed Ellsworth by 18 points late in the third quarter but came back to register a 54-52 win. The Wildcats have played their best basketball the second half of the season, going 5-3, with the losses coming against No. 1 Mount Desert Island and No. 2 Hermon (twice). Presque Isle, ranked seventh at 10-8, play No. 10 Orono (5-13) in the Class B prelim round at home Tuesday at 5 p.m. The Wildcats suffered two losses to the Red Riots during the season. The prelim winner advanced to play against Hermon in the quarterfinals at 9:05 a.m. Saturday, Feb. 16. PI lost to the Hawks late in the season by a mere six points. Senior guard Madison Michaud is a defensive standout and an outstanding rebounder for her size. The leading scorers are freshman Faith Sjoberg (12.4 ppg) and junior Maggie Castonguay (10.9 ppg), while senior Madison Jandreau (6.1 ppg) is a 3-point threat and senior Molly Kingsbury (6.2 ppg) gives the team a solid inside presence. Juniors Rebecca Rider (4.8 rebounds per game) and Alaina Legassie are key reserves. There is plenty to look forward to regarding the girls’ basketball program at Fort Fairfield. With a roster made up entirely of juniors, sophomores and freshmen, the Tigers will be a threat in Class C North for at least the next few years. Fort Fairfield enjoyed a strong regular season, as evidenced by a 14-4 record, and heading into Tuesday night’s ’s 65 p.m. home game against No. 8 Penquis of Milo, the team is not ready to dwell on the future quite yet. “You never know what to expect from a young team, but they have competed and improved each day to earn a home playoff game, which will certainly be a big challenge,” said veteran coach Larry Gardner. The Tigers boast a balanced lineup. The rotation includes juniors Riley Clough, Amber Sherwood and Cammi King-DeMerchant, along with sophomores Kourtney West and Brenna LeVasseur and freshman Camryn Ala. All average between 7 and 9 points per game, which is a plus for Gardner as no one player can be keyed on defensively. Second-year coach Jon Poisson and his eighth-ranked Beavers face No. 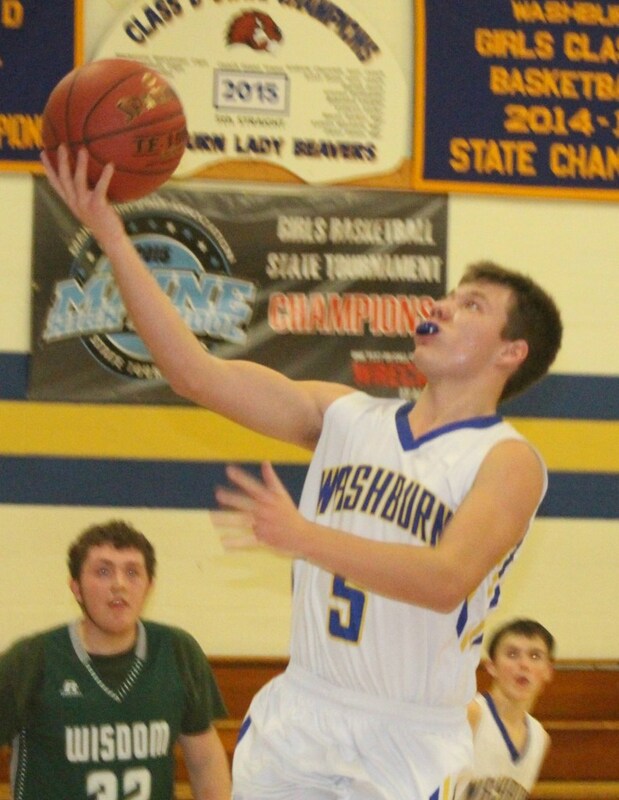 9 Wisdom in a prelim game Tuesday at 6 p.m., with the winner to square off against the top-ranked team in Class D North, Southern Aroostook, in a quarterfinal matchup on Monday, Feb. 18 at 8:35 p.m. The Beavers and Pioneers do no meet in the regular season, but have several common opponents. Washburn went 8-10 and is led by senior Kassandra Farley, who reached the 1,000-point plateau for her career midway through the season. Emma Johnston (7 ppg) and Kyli Farley (6 ppg) are other offensive threats and Raegyn Chavez has turned in some solid games. Wisdom, with a 6-12 record, is led by senior Alyssa Banville. The Wildcats already faced the difficult task this season of trying to make up for the loss of their do-everything guard Griffin Guerrette, who graduated. Then another obstacle was thrown their way when energetic senior forward Jason Dumais suffered an ACL tear, the third of his career, in late-January. Through it all, PI persevered and holds the No. 8 ranking in the Class B North standings with its 8-10 record. The Wildcats will host No. 9 Foxcroft Academy Wednesday at 5:30 p.m. in a prelim game, with the winner advancing to take on No. 1 and undefeated Hermon in the quarters at 3:05 p.m. on Saturday, Feb. 16. Jonah Hudson stepped up to take over the leadership role and responded as one of the top performers in the Big East Conference, averaging 16.3 ppg, 4.1 rebounds and 3.5 assists while also being the Wildcats’ best defender. His backcourt sidekick, junior Caleb Wheaton, averages 11.9 ppg and is a scoring threat from the perimeter and as a slasher. Trace Cyr (6.1 rebounds per game) is an inside force, while seniors Cole Paterson, Jacob Sjoberg and Will Bridges and junior Sam Beaulieu have seen their roles increased during the course of the season. Coach Terry Cummings said his team played its best game of the season at Dover-Foxcroft Jan. 19, resulting in a 66-44 win, as the Wildcats owned a decisive rebounding advantage which he believes they will have to repeat to be successful. The Tigers have had success in the tournament three of the last four seasons, but this Fort Fairfield team has a much different look than in recent years. The Tigers have a new coach in Vaughn McLaughlin and only one player back who saw significant minutes a year ago when the team made it to the Class C regional finals. He is junior guard Dawson Watson, who is the leading weapon on a team that went 12-6 and finished ninth in the standings. Watson is quick to the basket and is a distributor in addition to being able to create his own offense. No. 9 FF, which does not have a single senior on its roster, will play eighth-seeded Sumner in a Wednesday prelim which tips off at 6 p.m. in East Sullivan, with the winner moving on to play top-ranked CA in the quarters. Colby Langner, a junior, is the team’s inside presence who has had some big games the second half of the season, while Wyatt Keegan, Chase Griffeth and Avery Cormier have all assumed much greater roles this season. After not winning a single game all of last season, the Beavers made huge strides by collecting six victories and gaining the No. 9 position in the Class D North Heal Point rankings. Washburn will play at No. 8 Van Buren at 6 p.m. Wednesday. The prelim winner moves on to play No. 1 Woodland at the Cross Insurance Center in Bangor at 3:35 p.m. Monday, Feb. 18, in the quarters. “It has been a good redemption season for sure,” said Beaver coach Mike Hartford. “Our goal was to make a prelim to have that shot at getting to Bangor, and we managed to accomplish that. “My core group of guys committed to getting better and they worked through last spring, summer and fall to get there,” he added. Van Buren handed Washburn a pair of losses during the regular season and Hartford knows Wednesday’s game will be a significant challenge. Senior Patrick Saucier averages 10 ppg and 6 rebounds per game, while Aidan Churchill is next in scoring at 7 ppg. Steven Nader averages 7 rebounds per game and is Washburn’s best overall defender, according to Hartford. Colby Hewitt and Noah White are other starters. Hartford said freshman Beckam Vaughn, who sustained a knee injury in a Feb. 4 game against Hodgdon, will not be available. He will be missed as he averaged 10 ppg and 6 rebounds per game over the last five outings. The Panthers, under fourth-year coach Jason Woodworth, impressed by losing just three times all season (twice to Houlton and once to Fort Kent) and nabbing the top spot in the ‘C’ standings. The team has two go-to players in senior Ben Thomas and junior Brayden Bradbury, who averaged 18 and 16 points per game, respectively. Thomas can put points on the board in many ways with his ability to hit long-range shots and drive to the basket, while Bradbury is an inside force who also can be a threat from mid-range. Ethan Pryor, Jacob Carvell and Josh Thomas are other starters who have turned in some strong individual performances throughout the regular season. CA will draw the winner of the prelim between No. 8 Sumner and No. 9 Fort Fairfield in the quarterfinals, to be played at 8:35 p.m. Tuesday, Feb. 19. “In past years, we have struggled in the maturity aspect of the game,” Woodworth said. “This year, we committed to improving in that area, and it helped contribute to our good regular season. Last year, the Panthers finished sixth in the ‘C’ standings under first-year coach Dillon Kingsbury, but were eliminated by No. 11 Calais in a home prelim game. 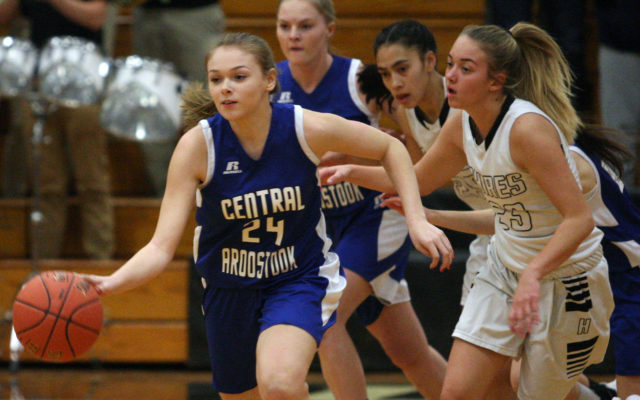 Central Aroostook made sure it avoided a prelim altogether this season. The team went 15-3 and Kingsbury was impressed with how the team has developed in just its second season under his coaching, which involves a new set of philosophies and expectations. Junior Breann Bradbury averages 12.2 ppg and 8 rebounds per game, while classmate Kate Levesque is a deadly 3-point shooter, averaging 11.2 ppg. Ashlee Harris (8.3 ppg) and Maci Beals (8.2 ppg and 5 assists per game) also start along with defensive specialist Sydney Garrison, with Annika Nicholas (7 rebounds per game) and pesky guard Libby Grass the top players off the bench. The Panthers will take on the No. 8 Houlton-No. 9 Stearns prelim winner in the quarterfinals at 3:35 p.m. Tuesday, Feb. 19. “We can beat anybody in this tournament if we make shots consistently, but with so many good teams it boils down to rebounding and making free throws down the stretch,” Kingsbury said. The Bears secured the No. 5 seed and a bye into the Class D quarterfinals thanks to some significant victories late in the season over Southern Aroostook and Hodgdon, after having lost to both teams in December. However, their biggest confidence-building game was a loss to Central Aroostook, the No. 1 team in Class C, on Jan. 21 in which they trailed by just two points with two minutes to play. Senior guard Isaac Currier said his team began developing a strong chemistry midway through the season, which helped in giving the Panthers a scare and in the bounceback games against SA and Hodgdon. “We started to connect with each other and our offense started rolling,” Currier said. Coach Cody Closson is in his second year as the team’s head coach. His starting group includes Currier (5.6 ppg), junior forward Matt Pangburn (8.6 ppg and 5.2 rebounds per game) and sophomore guard/forward Camden Michaud (8.6 ppg and 8.4 rebounds per game), who all serve as captains, along with sophomore forward Kyle Flewelling (5.9 ppg and 5.3 rebounds per game) and sophomore guard Austin Carver (9.3 ppg). The Bears will take on No. 4 Schenck of East Millinocket in the quarters in a game that will be played at 2:05 p.m. Monday, Feb. 18. Both teams hold 11-7 records. Currier, whose team thrived in road games with a 7-2 record, said one of the keys in the playoffs will be limiting turnovers. “We need to take care of the ball on offense and make each possession count,” he said.